Few of them can forget the backlash after then-Secretary of State Hillary Rodham Clinton said in 2009 that it was strange to talk about climate change without mentioning population and family planning. Critics immediately suggested that she was calling for eugenics, thus shutting down the conversation and pushing the issue back into the shadows. That echoes how Larry Summers, a liberal, also got into hot water by the welfare left for suggesting that biology, not white male privilege, is the cause of a social problem (lack of women in STEM). Same for Steven Levitt, who was censured by the left for positing a link between abortion (a biological solution) and the reduction of crime (a social problem). It seems like INTP & INTJ people are wired for success in the super-competitive post-2008 economy. In our new era of Social Darwinism 2.0 where coding is the new literacy, they, the INTP & INTJ people, have a biological advantage in an economy and society that increasingly rewards creativity, authenticity, introspectiveness, wealth, financial independence and analytical skill versus the obsolete, old-economy liberal ideal of collectivism, social skills, and equality. INTP & INTJ people, being that they tend to be smarter than everyone else, are more likely to make a lot of money and therefore own stocks and expensive real estate, neither of which is a bubble, sorry libs. Since end of 2009, S&P 500 generated annualized total returns (yes, including dividends) of roughly 16%. Impressive average. 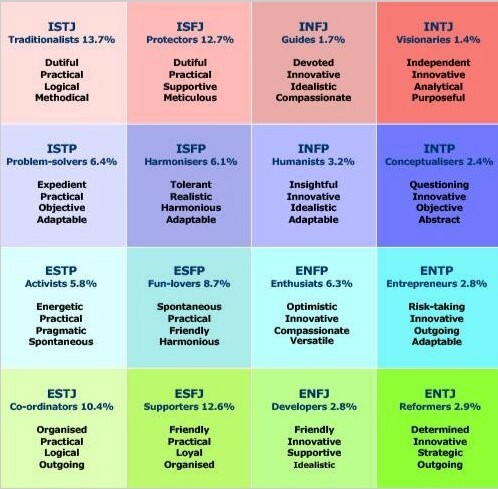 On the other hand, Myers-Briggs personality types have a lot of overlap and some of these qualities are hard to quantify. That’s why IQ is a much more accurate/objective measure of potential individual success than personality tests.